Watch a typical Hollywood romance film and you might come away thinking that going on dates is for young people only, the over fifty crowd need not apply outside of the comedy genre. 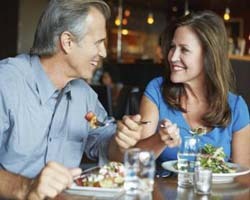 Despite what pop culture says about dating after 50, the reality is there's plenty left to see and do in life. And ladies, let me tell you: we want to see and do it all with you right by our sides. Here are five reasons why you blow our minds. You've got your own career, home, friends, and social life already in place. When you make time in that life for us, we know you're re-arranging your schedule, so we're not about to take you for granted. It feels good to be wanted, and we'll move heaven and earth to keep you interested because we know you can always go back to the way things were. Remember when you were a kid and the answer to the question “what do you want to be when you grow up” changed every five minutes? By this point, you've been there, done that, and own more than one t-shirt. That doesn't mean there's no room for surprise and discovery, but it also means you can tell me you're afraid of heights before we make reservations at the local rooftop restaurant. Everybody's online nowadays, but I remember what dating was like when a Facebook was something you bought your freshman year of college to learn who your classmates were, and 'Twitter' was how you described birds singing. So do you. And that means when we're together, we know how to connect without pulling out our phones, texting our friends, and worrying about relationship status updates. It's complicated? Of course it is. People always are. But we can work things out without involving the rest of the world. Let's face it, whatever they're playing on the radio today (when you can even find music on the radio) isn't for our generation. We may not see eye to eye on everything, but chances are we can find common topics of discussion when it comes to movies, songs, or television. Plus we don't have to go to clubs where the DJ could be one of our kids and we have to scream to be heard over 'music' that sounds like a microphone tumbled in a clothes dryer. You can look back on your life and say you're definitely not the woman you were years ago...but you can finish by looking at me and saying, “Thank goodness. You are not the man you were years ago either, but I probably wouldn't have found you attractive if I met you today.” Maturity brings honesty, and if you're mature enough to admit you don't want to settle for anything less than the best for you, then I'm mature enough to agree. If we're on the same page, nothing will blow my mind more than knowing you want to finish your story with me.